Restoring peace and stability to war-torn Syria and Donbass top Putin’s geopolitical agenda – along with enlisting world community support to combat ISIS and other takfiri terrorists in Syria and Iraq and the risk of their spread without a united effort to defeat them. Both leaders rarely speak, less often meet, the last time briefly in November 2014 at the Beijing, China-hosted APEC summit. No detailed meeting was held. Their longest discussion was a 15-minute encounter during the June 2014 D-Day commemorations in Normandy. Hostile relations persist. Putin is blamed for crisis conditions in Ukraine and Syria. According to The New York Times, a US official “insisting on anonymity” ahead of the White House announcement said the meeting’s “core message” was Russia observing Minsk ceasefire terms – ignoring Moscow’s commitment to peace and stability in contrast to Washington’s permanent war agenda. The Times didn’t explain. 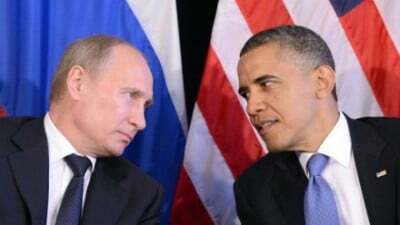 The Wall Street Journal said both leaders will meet “amid increasing tension over Russia’s role in Syria and hopes in the White House that there might be a diplomatic resolution to the conflict” – ignoring Obama’s war, his full responsibility for mass slaughter and destruction, Putin the best hope for ending it, dedicated to world peace, polar opposite Obama’s rage for endless wars. Discussions with Putin will accomplish nothing as long as Obama insists Assad must go – polar opposite his counterpart insisting sovereign people alone have the exclusive right to choose their leaders and officials, no outside powers, especially imperial ones for their own self-interest. The only viable solution is ending them. The strain of thousands of desperate people arriving in Europe daily may drive its leaders to ally with Putin’s agenda – international community unity to defeat ISIS and other terrorists. Damascus has committed Russian support in its struggle to defeat takfiri terrorists devastating Syria, Iraq, and perhaps heading cross-borders to continue their rampaging – with full US financial and military support.